Infamous line from an essay asking victims of the 2008 Sichuan earthquake to stop complaining about the shoddy construction of schools, which lead to the deaths of thousands of school children. The 7.9-magnitude earthquake that struck mountainous Wenchuan County, Sichuan on May 12, 2008 claimed the lives of over 5,000 children, whose poorly built “tofu dregs” schools collapsed on them. Government buildings weathered the quake far better. Angry parents were begged to stop protesting. Some were detained at the scene or protests, while others called off memorials at the warning of officials. 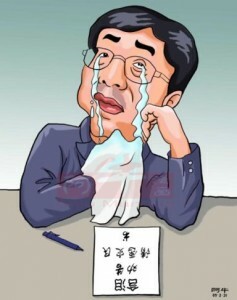 A month after the quake, literary figure Yu Qiuyu penned the essay “A Tearful Request for the Earthquake Survivors” (含泪劝告请愿灾民), in which he implored parents to stop their protests against the government. He suggested that the parents were being used by those with “ulterior motives” and by “anti-Chinese forces.” Many netizens accused Yu of trying to protect the corrupt politicians and contractors whose greed and negligence had led to so many deaths. Some “tearfully urged Yu Qiuyu to jump in a river” (含泪劝告余秋雨去投江). Angered by the criticism and the parodies of his essay, Yu wrote an reply to his critics, “You Are Not Permitted to Continue Insulting the Chinese People” (不准继续侮辱中国人). Artist Ai Weiwei lead an effort to collect the names of the schoolchildren, resulting in the performance piece “Commemoration.” He and the volunteers who came with him to Sichuan faced police harassment. The activist Tan Zuoren served a five-year sentence for “inciting subversion of state power” after he tried to compile a list of the children’s names. See also even the destruction is a blessing.